When you click on the given link,you will redirect to a page where you will get details of that particular deal. EsselWorld is an excitement and entertainment packed park that offers fun for everyone! The park features heart racing rides, a bowling alley, 3400 sq. ft. ice skating rink, dance floor and more. Head there with the whole family and you’ll find fun things to do for all! The park has a choice of eating options including Southern Treat, Domino’s, Taipan, Ohh! Mumbai and more! 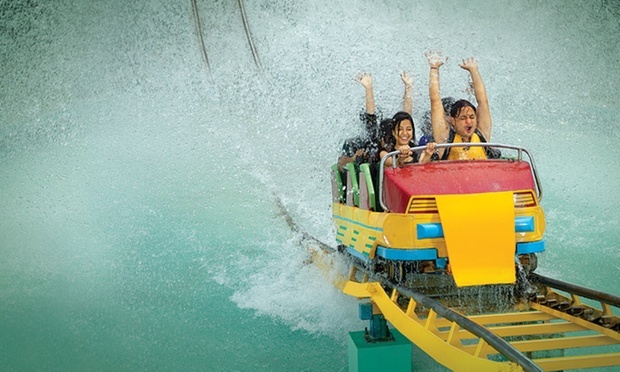 Water Kingdom is India’s largest aqua pool offering a splash of fun to all ages. The 22 acres water kingdom is the ideal family play port and features 3 kiddie slides, 4 family slides, 3 adult-thrill slides. Also have some fun with the water umbrellas, spinning water tray and waterfall. Like every kid’s dream, KidZania is a small community where kids get to make their own rules, have their own economy and play various roles. KidZania is a small dream city that follows these fundamental rights – to be, to know, to care, to create, to share and to play. It is built like a small city, complete with paved roads, battery operated cars, building, it’s own currency etc. that teaches kids to interact and behave in the real world through various role-playing activities. A small getaway or break from school life, KidZania is an excellent way for kids to grow, communicate and overcome behavioural barriers that are best gotten away with interaction with kids of similar age groups. The place is well guarded and secure for kids and offers a variety of entertainment options. 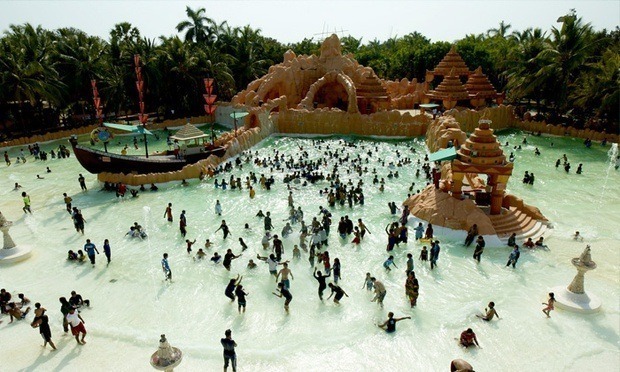 The Great Escape Water Park is a 26-acre water theme park in Mumbai dedicated to sheer rejoice. Recharge yourself at the adrenaline rushing monstrous gut – the 40 feet water slide or just relax with the soothing curls of the thrilling wave pool. Challenge your friends and family with the water park games or chase them down the water slides and land right into the lazy landing pools; there is something for everybody at The Great Escape Water Park. Let your hair down and enjoy the sights and sounds of a foot tapping rain dance DJ or join your kids at the multipurpose play area. You can simply indulge in some mouth-watering cuisines from across the country, prepared at the full-fledged kitchen. The 12 acre park amenities and facilities are geared-up to host over 3000 guests a day. An ISO-9000-2001 company, The Great Escape employs state-of-the-art safety and medical facilities at the park. Spread over 40000 sq. ft. in the heart of Mumbai, Smaaash is the first-of-its-kind interactive experience, bringing to you the perfect balance of virtual and real. Pioneering the field of sports simulation technology, Smaaash is home to highly immersive and interactive simulators making their global debut, where one gets the opportunity to test their skills by playing against the most formidable opponents for an incomparable experience. Featuring activities for men, women and children, Smaaash combines the best of sport, music, and dining for an involved entertainment experience for all age groups. Started in 2004, Timezone is your one-stop interactive entertainment destination. At Timezone you can get superb arcade games, exciting rides, fabulous prizes and much much more. Their aim is more about providing a bonding experience. So go relive your childhood at Timezone. Fix a play date with the hippest kid in town – Kidz town. This fun activity and play centre is located in the convenient location of Juhu. The establishment offers multiple options for the child to indulge in some childlike fun including offering an indoor soft play area, party venue, slides, ball pool, swings and a play area that is covers an expanse of almost 4000 square feet. Their team of trained professionals not only tend to the needs of the kids but ensure maximum safety. Kidz Town has also designed various membership packages in order to make your experience all the more comfortable and flexible. So go on and help your child learn while having fun. Primetime, located in Ghatkopar West is an after work hangout destination offering a variety of games, food and music. Their customers comprise of all ages and come here for thorough entertainment. As the name says, Play Around at Kandivali is a delightful indoor kid’s play center. Children as well as parents can have a ball here. This mini amusement park is well equipped with ball pit, spiral slides, zip line, trampoline, library and a number of interesting play panel wall games. Relax in the refreshing cafe, where you can sip your favorite beverage and enjoy tasty bites from multiple cuisines. Make your child’s birthday a special one by celebrating it in this exciting play park. Happy Planet – the name says it all! A place where your young ones can play all they want and feel happy while you indulge in some happiness of your own, is Happy Planet at the Phoenix Market City Mall. Happy Planet provides an ideal option for all the young parents who wish to spend some time doing some non-parental things without the guilt of having to see their kids cry or be sad. Happy Planets lets you drop your kids in their Bouncy’s Playzone where the attentive and friendly child minders will take care of the kids whilst you enjoy a movie, go to a spa or a salon, shop or dine as per your wish. Sounds terrific, doesn’t it? Well it is! A boon of it’s own kind, Happy Planet is where all the happiness for all the young ones (and for their parents) is! Yazoo Park, located in Virar West, is home to one of Mumbai’s tallest ride. It’s 35+ rides and entertainment activities i.e. amusement, adventure, thrilling rides, mini amphitheater, musical fountain, food court, kid’s zone and numerous rides make this amusement park fun for the whole family. Vardhman Fantasy is a sprawling amusement park located on Mira Road – Bhayandar area. No matter how old you are, you will definitely find something interesting to do here! The park features 7 different internationally themed zones which will keep you occupied for the whole day. After you have explored as much as possible, you can head to the massive food court to grab your grub. True to its name, Vardhman Fantasy will definitely take over your fantasies and just one visit will leave you yearning for more! Launched in 2012, Funky Monkeys Play Centers is today the leader and pioneer in indoor play centers for kids. They are India’s premier indoor play center and birthday party venue for kids. They have world-class indoor play centers across Mumbai, exclusively designed for children aged between 6 months to 12 years, which offer hands-on discovery and learning through spontaneous and unstructured ‘free play’, while incorporating elements of fun and entertainment. Located in Bhiwandi, Shangrila is a 3-star resort with a fun filled water park. Spread across acres of land, guests can be sure to have a fun time here. The resort has stay options for those who wish to spend the night. Choose from a wide range of fun activities – rain dance, water slides and more. Located in Lonavala, Della Adventure offers a range of adventure packages for the customers to choose from. Get your adrenaline pumping with ATV rides, Bungee jumping, motocross rides and much more. Apart from adventure packages, customers can indulge in local and international cuisines at one of their many in-house restaurants. Guests can gift themselves a massage or attain some peace with yoga classes. Snow World, located atKurla Westgives you all the enjoyment that snow brings – making snowballs, snow angels, snowmen, etc., without the bothers of snow – shoveling driveways, cars getting stuck under heaps of snow, etc. The many slides and rides, and other snow-themed amusements promise oodles of fun for the whole family!The most amusing news isto have pleasure all in a negative temperature of -10 degrees along with living the lifestyle of an Eskimo Snow world is the place to try out your first moves on the boxes, build up confidence on your board or skis or have your first crack at the jumps on Skates. The Beginner Park provides the perfect environment in which you can enjoy a gentle introduction to the snow park scene. The history of Mumbai deals with the growth of a collection of seven islands on the west coast of India to become the commercial capital of the nation, and one of the most populous cities in the world. Although human habitation existed since the Stone Age, the Kolis, a Marathi fishing community,were the earliest known settlers of the islands. Adbove list is not final, we are open for your inputs.